La Trochita: a very unique train - Esquel, Patagonia, Argentina. The trip by La Trochita, a return to the beginning of the century. Train fans around the world flock to this corner of the south, in Chubut, to find a gem of Argentinean tourism: La Trochita or Viejo Expreso Patagónico (as it is known in the international travel agencies). A train that is a real museum walking because its estrucutura and rails on which flows are a relic. But not only the machine itself is attractive and stands out from other trains in the world. Its value added is the landscape where it goes. La Trochita's vapor dissipates in the clear Patagonean sky. Its rare wooden wagon wheels by a very narrow trail on a steppe covered in wildflowers and there, walking, it losts between the imposing mountain range of Chubut. Finally, it seems a little train toy moved by the imaginative mind of a child. 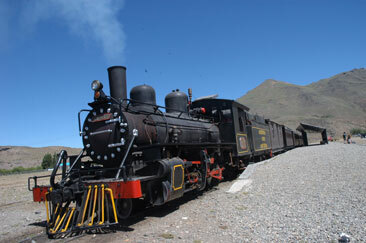 The tour of this famous tourist train is done from Esquel to Nahuel Pan stations in a convoy pulled by locomotive. Its tiny size cars and its particular narrow gauge make it one of the few that survive the test of time. 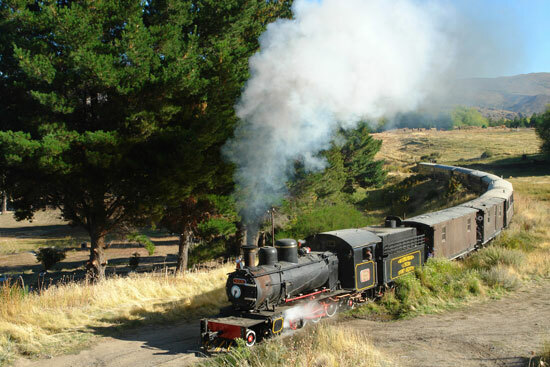 La Trochita snaking through magnificient Patagonian landscapes, an ideal combination to enjoy a pleasant trip. From Esquel, you undertake a winding path of changing geography. After walking a few kilometers you arrive at the town of Nahuel Pan, where there is a station and from where it returns to Esquel. In the surroundings and dwelled are some Mapuche descendants, mainly devoted to pastoral activities and crafts production in looms, which they sell in craft shows that are held occasionally. Every year in March, its main religious ceremony, called Camaruco, calls them at the foot of Nahuel Pan hill to invoke his God, Nguillatún. In winter when the snow paints the landscape in motion the train, passengers themselves can take logs to the salamander's car, and then heat and stay inside.